I'm sitting here enjoying my Sunday with a new television box and two children happily immersed in their own activities. Hubby is also happy sat on the sofa with his Bear Grylls and full stomach from this mornings breakfast cooked by myself. It was rather yummy I must say. This week it was the last week of school. As usual I wanted to make Monday a good starting point to the week. I dropped Midge off to school and then hopped on a train to Truro with Little A who loved this (go figure!) we saw the the Court House, the Cathedral in the distance then went to have a Costa and play in a toy store. We made it back in time for nursery which was great. On Tuesday I mooched around town before meeting my Hubby for lunch which we haven't done in ages. I only took a photo of him (complete with growing beard!) then we put technology to one side for a nice meal and chat. We both collected the children and headed home out of the weather. Wednesday I got some chill out time before heading home to clean and tidy. I had a hot chocolate and people watched whilst enjoying my new charity shop book find. It was so funny I was laughing out loud, bit embarrassing! The children had a non uniform day Thursday so they wore their new shoes that I bought the previous day and were very pleased. I spent some time scrambling about for two donations plus £4 for a trip starting after half term. Anyone else do this? I managed to post off some happy mail today and run some errands. I was on pick up duty because Hubby had to help his sister out so I was getting a good work out! Friday was a lovely day. I watched both the children do their Easter bonnet parades and they both did me so proud with their cat walks. They looked so sweet. 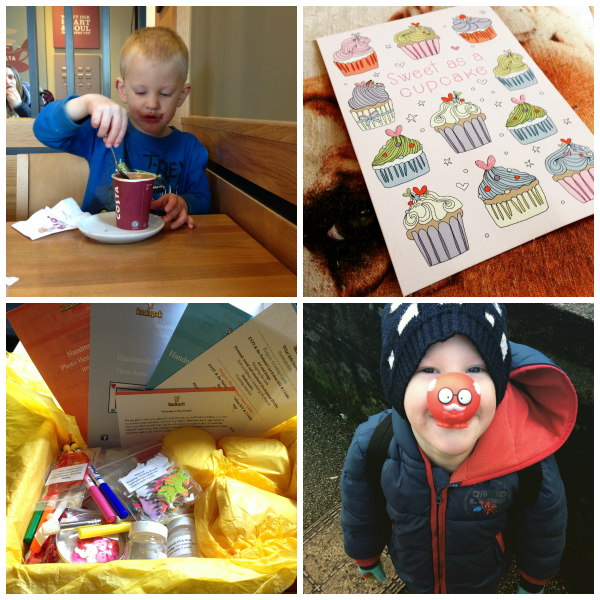 I had a Costa with Mum and Little A (Mums treat- win!) then after nursery I treated my mum to lunch out before meeting Hubby in town to go to school. My niece arrived in the evening which was a surprise for my two. They made lots of mess, did crafts and we camped out in the front room (my back!) Mum came back at 4pm Saturday where we had a nice stew for dinner and waited for my sister to come back from university by train. They spent a couple hours at my house before heading home for the night, it's so good to have her home! Next week it's Easter and half term so I'm thinking baking, chocolate, Midge heading for sleep overs, take out pizza because Dominoes finally opens near me!! I'm visiting my Gran for Easter Sunday and hoping to see my sister and I should be going out to meet some friends and their children for the day. Last week seems to be a blur already! It was a tiring week more than anything, but a good one. I started it with a morning on Monday staying out with Little A at the library and buying a hot drink and a newspaper. I like starting my Mondays in a more positive way at the moment. 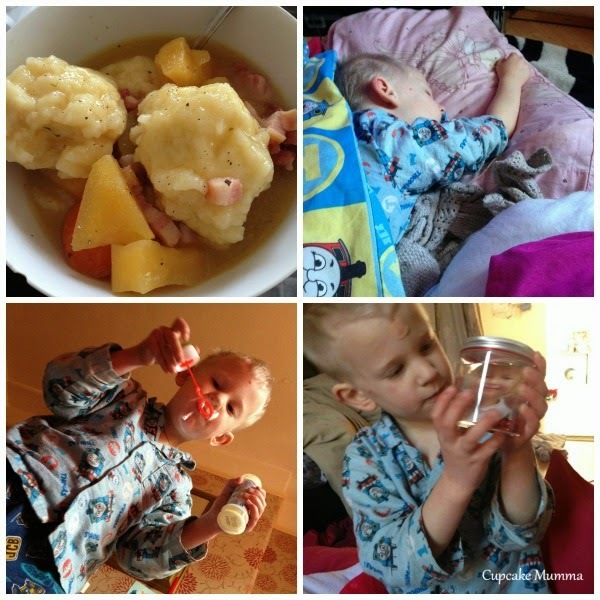 On Tuesday after school Little A came down with a bit of a cough, which soon became another bout of croup, two days off school for him! On Wednesday I crafted with Little A and then did some with Midge after she finished school. I got some exciting happy mail this week in the form of a Harry Potter necklace (which I bought purely for the pendant to re use it! I then got my PJ bottoms on Thursday which I opened in Costa with my Little A (who ate both my free from wraps which are not cheap!) Anyway, I love my new PJ bottoms! I dropped A off and saw the schools chicks they've been looking after (they've just hatched very recently!) They were so, so cute. It's caterpillars next which will be great for the children. 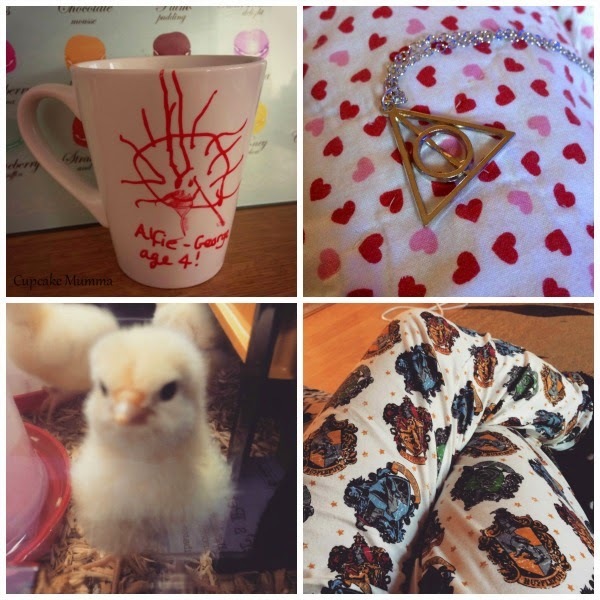 Home crafted mug// Deathly Hallows// Nursery chick// Harry Potter PJ bottoms! I had such a wonderful time joining in with Lucy's swap which was a huge spring time exchange between people from all over the place. For the first time ever my swap partner wasn't to be found on social media or blogging. I had a small amount of information and I really enjoyed just letting myself go for a spring themed box. My parcel was just beautiful, the photos are all below. I adore this exercise book and gel pen- so me! Thank you so much to Sarah and thank you to Lucy for running this rather big swap and cheering a lot of people up with happy mail this month! Koalapak The Craft Box for Children! The children received their box (The Mega Box) in good time and it was even personalised with both their names printed on the front. I thought this was a lovely touch! The boxes start from as little as £3.95 up to £16.95 you can subscribe monthly or buy one off boxes, plus add extras for siblings when buying a smaller box. As you can see SO much. Both needed my help with the snow globe craft which we all found fun. Little A picked up a photo of Midge for his and Midge drew herself a picture which I then covered with the tape provided to make sure it was water proof. We stuck the photos to the lid (I taped them in the end!) added water, glycerin and the confetti (Midge put glitter in hers from my craft draw) and they both loved the outcome. 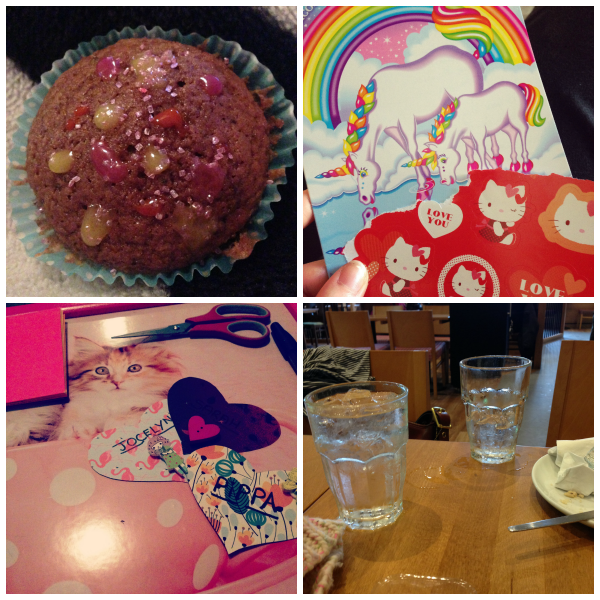 Whilst Midge was at school Little A made some cards for an upcoming birthday, Midge made hers when she came home. Such a straight forward task meant that there was very little involvement from me at all. I think our favourite one was the mug which Little A and I did together when he was feeling brighter after several days of croup. He drew some spiders on his mug (I had to draw something first so he got the idea) he then went and drew on a plain pink mug I own such was his fondness for this craft!! We baked the mug at 90 degrees for an hour and it's fab! I'm going to buy a plain mug for Midge because she missed out on this craft. From a parents point of view, I loved the excitement my children got from this craft box. I loved that they created projects that I've never thought of showing them before. What I also loved was the inclusion of an information sheet detailing what skills my children would be learning and developing according to the EYFS framework. This really pleased me and I found it interesting, Ive never really thought about all the skills children pick up from crafting! To sum up, I really, genuinely feel this is a fantastic, great value craft box for children (and heck, the whole family if your children are young enough to need your help!) Crafting is so much fun that I think it's fantastic companies like Koalapak are putting these boxes together with easy, fun projects that come with everything you need to complete. Last week I visited the GP, a lovely woman who is always so honest and supportive of my decisions, to lower my medication. I take medication for my anxiety (general and social) and for low moods. I've been in a better frame of mind for some time now and with the help of some actual daylight I began to feel more positive. I had been forgetting to take my pills so often I was effectively on a lower dose anyway, it just made sense. Volunteer) is maybe playing havoc with my mind or if actually I don't need these pills anymore at all. I sometimes forgot my pills so often there would be 2 weeks full in a sachet. I didn't really think about it..I felt,for once, 'normal.' So maybe I don't need them? Maybe this brain of mine is chemically balanced enough and is feeling worse WITH the medication? Is that possible? 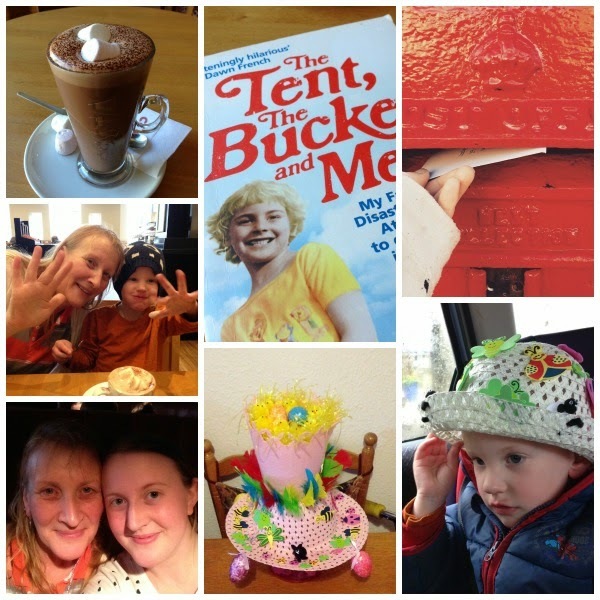 I've had a lovely week this week! I wish the weather would brighten up a little though, it does make my lowering of the old low mood pills a slightly tricker job.. There's been many positives though. I had a lovely afternoon on Wednesday with a friend who has just come back from the USA. She's due her second child very soon and it was wonderful to catch up, talk about how things have been while she's been away, talk about the children and of course lots of labour and baby talk which I loved! I had a very nice time with her and a lovely hot chocolate and Cherry Bakewell too. We recently had Midges report through and it's looking really good. She's really keen on writing and does her own stories, practises her writing and even has several penpals. Little A is doing well too. The key with him these days is a hell of a lot of patience and organisation (also acceptance is a good thing to have!) Both children are doing really well as far as I'm concerned and I'm very proud of them. I'd like to look into outside school activities for them soon. Midge also got her Bronze award for 100 house points today which is great! The week has generally gone well. My Gran is now back at home and I'll be seeing her this weekend, we've had a great craft box for the children to review and I've had some lovely happy mail this week too. I'm looking forward to Mothers Day this Sunday, a nice big breakfast and some beautiful items from my two little ones no doubt! It's been a really tough week here. Don't get me wrong, I've had plenty of ups and things to smile about but it's been kind of emotional and I've not managed to keep up with things. A very dear member of our family was in hospital for a planned operation but unfortunately some complications arose. Long story short, everything is very much okay and we can all breathe a sigh of relief but it's been worrying, emotional. I'm tired. Of course there's other 'stuff' but that's all it is, 'stuff'. 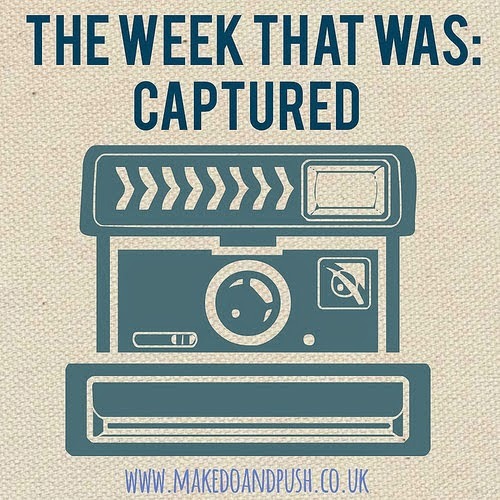 I'd like to recap on the last two weeks because I've been doing so well with my catch ups and I don't want to have any gaps! I introduced Little A to tree climbing which he absolutely loved. We had a Costa together at the end of the week and visited the library to return books and kill some time before nursery. Midge had world book day at school and added to the large collection of Elsa's in there! 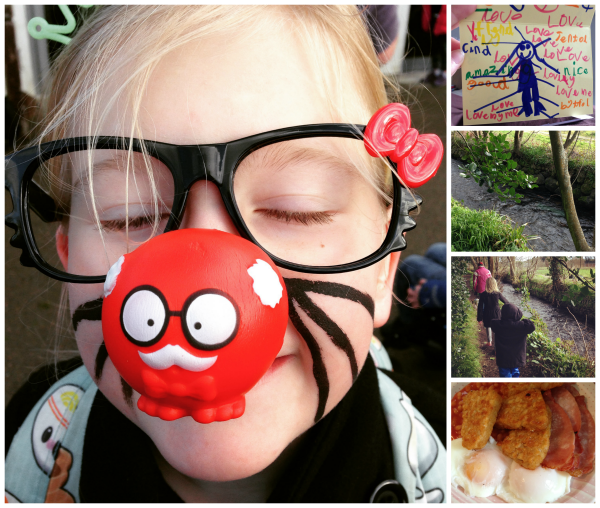 Sadly she was sent home at lunch because of earache which has bothered her somewhat over the weekend still. I enjoyed a lovely coffee date with a friend and a little charity shop look about, although I didn't buy much, just a history book. I read a fantastic book I picked up from Costa's book corner, My Sisters Keeper. I read it in two days! I've written some happy mail which A helped me decorate and had a lovely box of chocolate eggs from my sister delivered which I'll be sharing with my Aunt as they're vegan Moo Free eggs. I spent several days seeing my mum because of hospital visits to see her Mum, my wonderful Gran who is now recovering well. She treated my two to doughnuts after school one day and I made us dinner several times. I may have had a few naughty take outs last week too- oops! The children made good use of their scooters and bikes this week, discovering a new path to school which included a rather big hill to go down rather fast! The week before was a good week too, not so emotional! I got hooked on chocolate cornflake cakes, made homemade dinners and enjoyed yet another hot chocolate date with Little A before nursery. We enjoyed another library visit and he's been really getting into the environment there and loves popping in to see the children's corner. I finished off a Harry Potter novel and picked up a new one I've not seen before, The Language of Flowers. Finally during this week, I had a GP visit where I lowered my medication for my anxiety and low moods. I feel pretty good about this and hopeful I can maybe be off them soon but for now I'm just focusing on the lower dose. Hope you've been having a good couple of weeks too, I'd love to know what my readers have been up to. I've taken part in several swaps recently and although late, I wanted to share them here with you all. 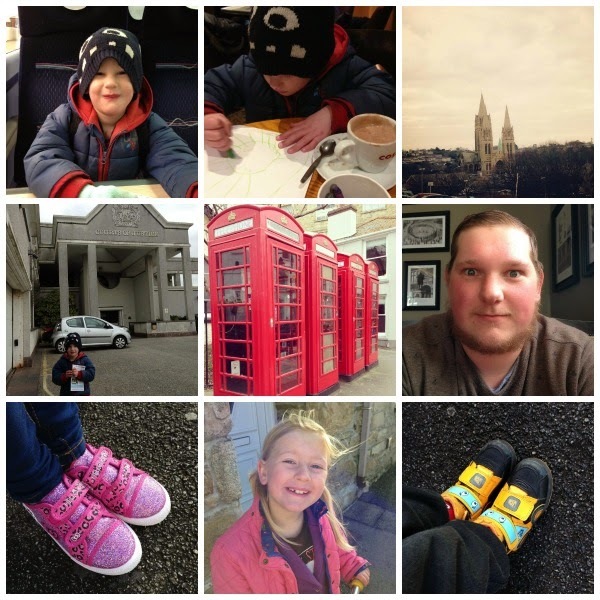 The first was an Instagram swap titled 'January Blues Swap' the idea being that after the Christmas period where we get thrown back into our routines, dull weather and clutter we need a little pick me up. Here's what I sent my swap partner: a kawaii pencil case, yummy chocolate bar, mix of nuts and lovely new socks. I also took part in Hannah's #dicraftswap which had the prompt 'zodiac'. I made my partner a small canvas with the Libra constellation, a year of Libra book, and a make it yourself dream catcher. I was quite pleased with what I found to be honest and loved painting my mini canvas. ive just finished the next swap which was titled 'love' and will share this when the swap is over. Here is the beautiful swap from my partner Louise. She sent me a key ring with the Scorpio constellation, a Scorpio bookmark, a note book which has been decorated for me, a beautiful stationery box which I can't wait to start using for my letter writing and some cupcake stickers which aren't pictures because I've used them already! I love stickers! Lastly I took part in Jocelyn's #bringbackpaper stationery swap. Here's what I received. So much lovely stationery I can't believe it and I feel thoroughly outdone this time round! 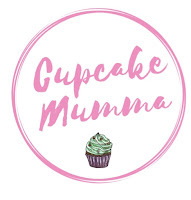 Keep an eye on Joceylns and Hannahs blogs for future swaps, my blog for an upcoming mug swap and I've got more swap posts coming up in future! February was a really nice month. I've had enough of the wet school runs and cold weather though, it doesn't help that Spring has been doing nothing but teasing me! I've loved seeing the last of the crocuses and the first daffodils on our local green. 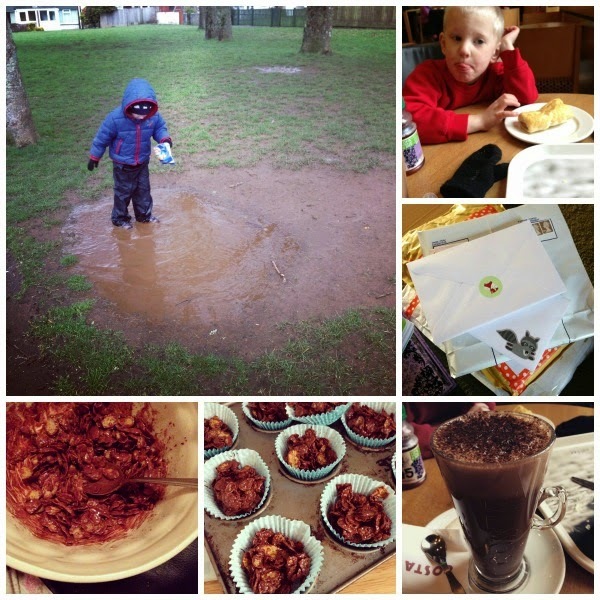 The children have enjoyed their school runs with some muddy puddles to play in along the way. At the beginning of the month we enjoyed a bit of snow, which was lovely. February was a great month for stationery. I started a new book for a friend and I to record our writing and trips. We send it back forth, or at least we will when I've posted it on its first journey! I've loved my bird themed #Paperhaul box and had some lovely stationery in my gift swaps (which I really need to blog about!) I was enjoying being a bit of a bookworm in February too. 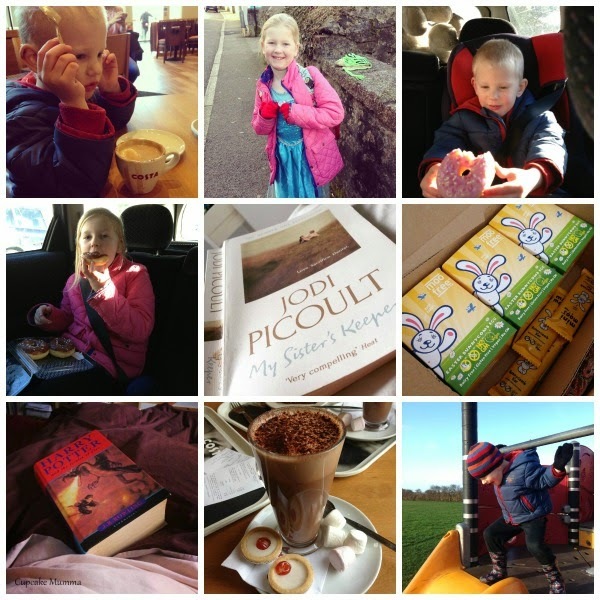 Our Peadiatric Appointment and The Start of Our Journey- this was so useful for me to write. I added some tips for those going to their first Peadiatric assessment too which I know has helped several people. How Sensory Processing Disorder Affects my Son- I really enjoyed writing this post. Although Little A is still very much in the process of being referred for occupational therapy and we have no definite answers for his behaviours we are working with SPD which has fitted with A and the useful things I have found online regarding the disorder have been very useful to us. Many people thanked me for this post which meant a lot to me. My Sunday Photo- With Olaf!- This was a popular Sunday Photo post last month and one of my favourites. I'm really looking forward to March. My sister returns from University and we get celebrate her 21st birthday. My Gran should be coming home from hospital soon and it will be so lovely to spend time together as a family. I'm also excited to get ready for Easter and do some gift swaps which keep me happy. This months box popped through my letter box recently and can I just say how much I love this theme! This month, #Paperhaul have gone for a box of wonderful bird themed stationery and if there are other animal themed boxes in the future I cannot wait to receive them! Bird themed washi tape is this months tape of choice. I've been tempted to buy this online recently but I ended up buying a similar one so I'm really pleased that I now have it in my collection. I can't wait to seal my letters with this pretty tape. These little cards are just fabulously unique, quality cards. They're always great to slip into a swap parcel I put together or sometimes add to a letter I've penned to a penpal. These cards are very fun, the owls are so cute. Finally I can say the tags in this box will be used by myself because they are just lovely and very me! For the last two months the gift tags haven't been very 'me' so have found new homes but these are mine for my scrap booking! Gorgeous bird stickers. I am a huge sticker fan so I find I'm always hunting for the stickers in the monthly boxes first and I'm never disappointed. I also love pigeons which is controversial, I know people who really dislike them and have strong opinions on them! Ah well they make cute stickers! Finally, the scrap papers in this months box are just beautiful! Can't wait to see the March box! *I am part of a blogging group who receive a #Paperhaul box at a reduced price. However, all photos and words are my own.